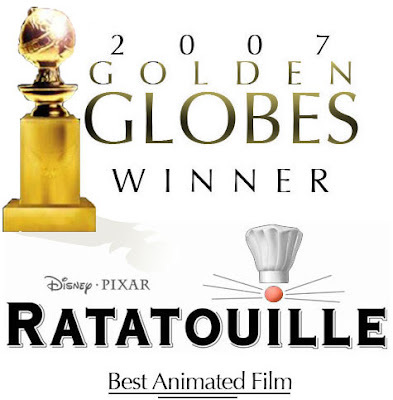 Congratulations to Brad Bird, John Lasseter and all the talented artist at Pixar. Well deserved! Congrats to all involved. Finally, some recognition! Thank you Golden Globes. How is a well received film that did fairly well at the Box Office, a disappointment...? or are you still beating that old JHM horse...nah, that's no way to celebrate. Just enjoying how all the naysayers were whispering doom and gloom about this one. I wrote that with a grin... sorry, but I like it went the negative nabobs are left speechless. You can stop calling out Jim Hill now. Really, we get it and there is no need to say that in every Ratatouille post. Forget about him, its a decent film and definately deserved the award. Hopefully it will take home an Oscar and too bad Enchanted didnt get anything. Hey Folks, think about what you write. Did Jim Hill congratulate the film on its win on his blog?...(crickets). Didn't think so. Good work Honor Hunter! You're right "anaheim", lets just spend all of our energy pushing the negative...I hate Jim Hill! He was soooo wrong about Ratatouille! He's always saying bad things about Pixar! He said the movie wasn't going to break 200 million domestically...and it did!!! (by not a lot, but still)... Ah, this is so productive...I just spit on the floor! Yes, Jim Hill was wrong...he was wrong! Okay, back to celebrating Ratatouille's win at...wait, what did it win again...uh, I forget, but who cares...because Jim Hill blows!!! CONGRATS TO US, WE BEAT JIM HILL!!! Who's this Jim Hill guy you people have been talking about? Me, I've never named names... there are people out there that have talked down "Ratatouille" that don't have the initials JM. The results speak for themselves and after today I will not speak of it again. Why don't you go with me.